In the papers today I read of how a Fenger High School student was shot and killed during an apparent burglary during a time when he should have been in school. On the Dist. 299 blog one comment reads "the article "gives a true sense of the type of awful stuff that our kids and our high schools are dealing with…and it really shows that there’s often some good hiding behind the “thug” posturing that kids do to try and fit in or to survive." Fenger is in the 60628 zip code on the far South Side of Chicago. I went to the Tutor/Mentor Chicago Programs locator and did a search to see how many organizations in that zip code offer any kind of tutoring/mentoring. I found 19 listings. Sounds like a lot. The listings in the T/MC program locator have been compiled since 1993. We've never had regular staff to do our surveys, so some of the information is probably out of date. Many organizations don't have web sites that show what they do, so it's difficult to know what these 19 organizations are doing to help high school kids avoid the "awful stuff" and get the support they need to stay in school and move toward jobs and careers. I'd like your help. Please search the Program Locator listings and help me update the data. If you find a listing that no longer offers tutoring/mentoring, or does not serve the age group we show, then email tutormentor2@earthlink.net and give us updated information. At the same time, as you look at web sites of other tutor/mentor programs, in Chicago, and in other cities (using the LINKS LIBRARY) I'd like to ask you to help the agencies in 60628 and other areas, get the volunteers, dollars, ideas, technology, etc. that each needs to be the best at helping kids make their way through school. In a city like Chicago, it's not enough to have a few good programs in a few locations. We need great programs in every high poverty neighborhood. The resources on the T/MC web site are intended to help community/business/faith partners build and sustain great programs in neighborhoods like that surrounding Fenger High School. To the Mayor. To the Tribune. To Presidential Candidates. If you really want to help close the achievement gap and reduce dropout rates, you will have to directly zero-in on matters that are keeping too many students from connecting effectively with good instruction. Good instruction, of course, is essential! It's a truism that schools continuously need to improve the quality of teaching. And, a logical role for you in this is to contribute to efforts to enhance the recruitment, preparation, ongoing capacity building, and retention of good teachers. But, as you know, better instruction alone cannot ensure that all students have an equal opportunity to succeed at school. Indeed, focusing mainly on improving instruction is a recipe for maintaining a very unsatisfactory status quo for too many students in urban schools and in poor rural areas. So, focusing on instruction is not where you can make your greatest contribution. I encourage you to read the full article and use it to write a letter to your own mayor. If you read this, and if you want to be elected to be President, or Mayor of a big city, I encourage you also to review reports like this one that I received today from the Illinois Facilities Fund. It is titled, Here and Now: The need for Performing Schools in Chicago's Neighborhoods. Like the Chapin Hall Center For Children report that I wrote about last week, this report includes maps that show where poverty and poorly performing schools are concentrated. Leaders need to be building an understanding of the information coming from UCLA, and using maps to build a strategy that makes good schools and a comprehensive network of non-school learning supports, like volunteer-based tutoring/mentoring programs, consistently available in every high poverty neighborhood, and near every poorly performing schools. Leaders need to be learning from organizations all over the world, such as at http://www.healthworkforce.org/guide/Youth-Mentoring.htm. This is just one of more than 1000 resources in the Tutor/Mentor Connection Links Library. Business and professional leadership needs to be involved in sophisticated and comprehensive ways. Spending millions of dollars to building charter schools is not the answer. This does not engage the people from your industry as tutors/mentors who expand the social capital for youth living in highly segregated, high poverty neighborhoods. Look at the maps. These are the places where schools are performing poorly. Building strategies that engage your employees, your technology, your knowledge, your jobs and your customers in a long-term collaborative effort that leads more kids through school and into 21st century jobs and careers is where the answer can be found. Bringing such groups together in a network of purpose is what I hope mayor and future presidents will do. During a Public Policy Forum hosted in Chicago on 1/24/07, maps were used to show the changing population trends and their implications for future services. The research was created by the Chapin Hall Center for Children. The T/MC has used maps for many years to show poverty demographics and locations of poorly performing schools as an indicator of need for tutor/mentor programs. The T/MC Program Locator includes a Map Gallery, and a searchable database that visitors can use to shop for programs in different parts of the Chicago region. However, we've also built a GIS links library, with links to different organizations in the Chicago region and nationally who are using maps to create a better understanding of poverty as the root cause of many other social issues. During the meeting today I invited the 300-plus participants to use the GIS links on our web site as a resource in their own planning and networking. In addition, I invited them to add additional links, showing other sites that use maps to provide a spatial understanding of important social issues. I also invited people to tell share information about forums where people are using maps to share information, network and collaborate, so that all children in the Chicago region have equal opportunities for an education and a life out of poverty. Finally, if you know of people who blog the issues that were discussed in today's forum, add your link to the T/MC links library or introduce this resource in the comments section below. 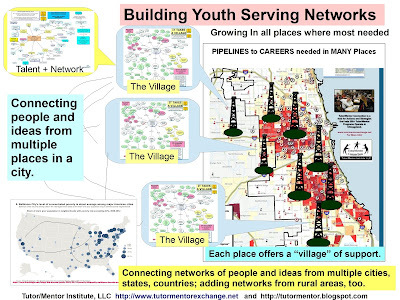 If we build a network of Chicago area and national organizations using maps to make better decisions, then the next step is to create blog-exchanges at strategic times throughout the year, so we can draw a growing number of people together to look at this information, reflect on it, and use it to do more to help kids living in poverty neighborhoods. Go Bears! The Super Bowl of Life. I've got to admit I've been a Chicago Bears fan for over 40 years. So I'm excited that they are going to the Super Bowl. But as I watched this game, I saw men who would be great spokespersons for tutoring/mentoring. For many years I've wanted to get sports groups involved with the Tutor/Mentor Connection. Many athletes come out of poverty neighborhoods, and most have befitted from having many mentors and coaches in their lives. While many athletes have foundations and do great things to help their communities, there's no strategy that I know of that enlists athletes and coaches in an effort to use their celebrity visibility to draw attention to a social cause, and to draw volunteers and donors to specific neighborhoods throughout a city. For instance, on the Super Bowl broadcast Terry Bradshaw, a former star quarterback, and current TV broadcaster, made an appeal for viewers to stay involved in helping survivors of Hurricane Katrina. The TV footage focused at New Orleans and the Lower 9th Ward, but I heard him end a phrase with "and the other areas". stars, in different cities, would have many opportunities to focus attention, and draw resources to the various parts of the entire geographic area where volunteers, donors, and all sorts of help will be needed for many years. In the same way, I want to enlist athletes to focus attention on the high poverty neighborhoods of big cities. Instead of just talking about the Boys and Girls Clubs, or Big Brothers, Big Sisters, or other highly visible charities, we need to focus attention regularly on every neighborhood where kids need help, and the organizations in those neighborhoods who are providing help. This is a strategy I hope athletes will adopt. If you read this, and you know a Bear, or a Bull, or a college coach, or even a high school coach, who might want to be a champion of this idea, please pass this on. This is a team game too, just like football. We'll get to the Super Bowl of life if we can get more people to help us. I'm part of the Non Profit Blog Exchange, #5, in which I've been asked to review the Smart Communities blog. The site is written by Suzanne Moorse, who is President of the Pew Partnership for Civic Change and author of Smart Communities: How Citizens and Local Leaders Can Use Strategic Thinking to Build a Brighter Future. I've participated in most of the past blog exchanges. By connecting blogs we meet new people, and we connect networks. I do this intentionally. The graphic I show illustrates my efforts to create networks of support in business, college, and faith communities, in many cities, not just Chicago. I was not aware of the Smart Communities blog, so when I visited today I was pleased to find so much information that relates to what the Tutor/Mentor Connection is trying to do. I encourage you to read it and browse through the various articles. Every article points to information that informs readers about some of the educational, social and economic challenges we face in America. For instance, one article is titled, "Making the School-Work-Community Connection"
As I starting scrolling down several months worth of articles that Suzanne has written, I thought of a challenge I face with the Tutor/Mentor Connection. There's too much information to read, not enough time. The bigger challenge that Suzanne and I both face, is how do we get millions of people to read and learn from this information, then apply it in their daily actions. 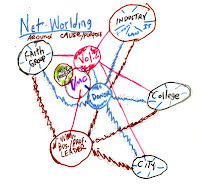 I've been part of almost every Non profit Blog Exchange, so the network of learning is extensive. It's overwhelming. For instance, if you read, Collaborative Blogging for Strategic Reasons, you'll see some inspiring ideas about networking through blogs. Instead of any single blogger being responsible for reading and understanding everything that is included in our blogs, I feel people who care about the same issues can share the responsibility of helping a growing number of people around the country connect with this information, read it, understand it, then put their understanding into actions that help kids. Hopefully by now you've seen an ad in a newspaper, magazine or on TV featuring celebrities like Clint Eastwood. These are part of the National Mentoring Month campaign, are intended to encourage more people to volunteer to be mentors. b) Another was Pupils Still Far Behind, a front page story on the Sunday, 1/7/07 Chicago Tribune. This story said that after five years, not much has been accomplished by the Federal Leave No Child Behind act. c) Another was Minister Offers Ex-Convicts lift on road to redemption. This was also on the front page of the 1/7/07 Chicag0 Tribune. One quote in the story was "Police attribute uptick in murders to parolees who returned to communities." d) Then there was the column written by Mary Mitchell of the SunTimes, on 1/7/07, titled "Every Door has been shut in my face". This was about a parent/guardian who had been looking for services that could help with an out of control teen, but who was not finding information about existing services. The only thing that connects these stories is that they were in one of Chicago's papers, and they are stories that are the result of poverty, and too few public services in the neighborhoods with high poverty. 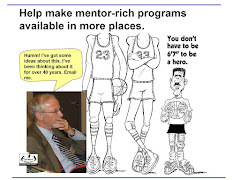 As the Mentoring Month Ads take place, Chicago Access TV will be running a mentor recruitment slide show on Channel 21, that invites volunteers to be tutors/mentors in Chicago area tutor/mentor programs. These point to a Program Locator that we host at http://www.tutormentorconnection.org. Visitors can search by zip code to see if there are any tutor/mentor programs in different parts of the city. You'll find contact information, and even web site links, if the program has a web site. Using this, parents, volunteers and donors can find existing programs in Chicago and offer them their support. However, if you search the Southeast Side, which the Tribune focused on in its 1/3/07 story, you won't find many programs. If you search the high poverty neighborhood, or areas where ex-convicts are returning in large numbers, you'll find few comprehensive tutor/mentor programs. Thus, parents who are looking for help, can't find help. Another story I've been following is the one about Oprah Winfrey spending $40 million to build a school in Africa. It's her money. The kids in Africa need it. Hopefully she'll stay interested, and involved, and in 8 to 12 years some of these kids will be working in her company, or using her inspiration to help other kids in the world have great schools and great mentors. This is what donors and policy makers seem to not realize. It takes 12 years for a youth to go from first grade through high school, and another 4-8 years before that youth is starting the climb the ladder of a career. That doesn't happen for too many kids born in poverty because the type of support they need does not exist, and there aren't many people like Oprah, or the volunteers at Cabrini Connections, who are trying to help them. I just hope that Oprah's example inspires some other zillionaires to spend $40 million to help us build and sustain comprehensive, volunteer based tutor/mentor programs in the neighborhoods of Chicago that get attention because of negative news, and high rates of poverty. I'd like to be writing about such donations in future blogs.